Today was our last full day at Skymont. It was a day to finish up on merit badges, play some games, relax, and start packing our gear for the trip home tomorrow. As has become our practice after the regular camp flag ceremonies, several of our scouts participate in the Brazilian flag ceremony. Today, we recorded a video of the morning ceremony involving our scouts. You can see it here on youtube. After breakfast, serval scouts headed to various program areas in order to make-up requirements they may have missed during the week. 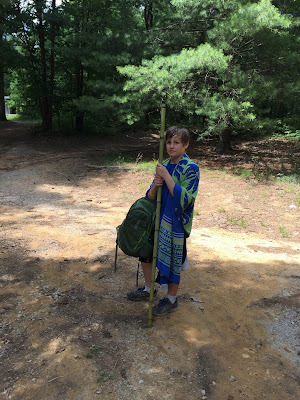 The first year scouts in the Polaris program took a five mile hike and several members of the troop headed to the waterfront for the mile swim. The three swimmers were Louie, Davis, and the scoutmaster. In addition, Ethan and Joe, Hunter and Mr. Williams, and Creighton manned three canoes that accompanied the swimmers as spotters. As we swam, the scoutmaster came across an old piece of rope floating in the water. The rope was passed to Hunter and Mr. Williams for later disposal. They devised a plan between themselves to use the rope for a nefarious purpose. As they passed Creighton's canoe at the last turn, Hunter yelled "snake!" as he threw the rope at Creighton. The result was predictable and Creighton's shriek echoed across the lake. All three swimmers completed the swim in record time, leading the scoutmaster to believe that the course is actually less than the advertised mile. Unfortunately, there are no photos of this mighty endeavor because the scoutmaster forgot to provide the waterproof camera to Mr. Williams. Upon returning from the mile swim, several of the boys were discovered in the campsite playing a game called Ninja. 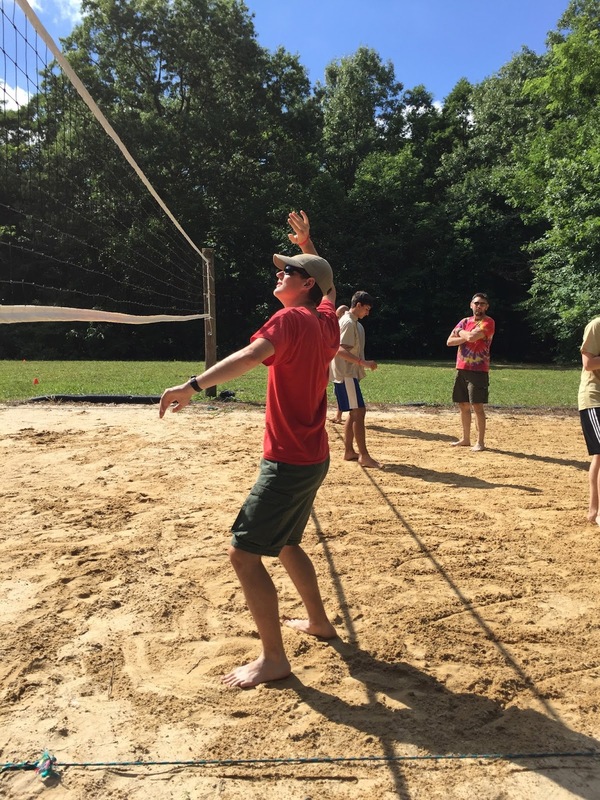 Although the game apparently had some purpose, the scoutmaster mistook it for a yoga class. You may judge for yourself based on the photos. The unusual carryings on of the scouts before lunch. 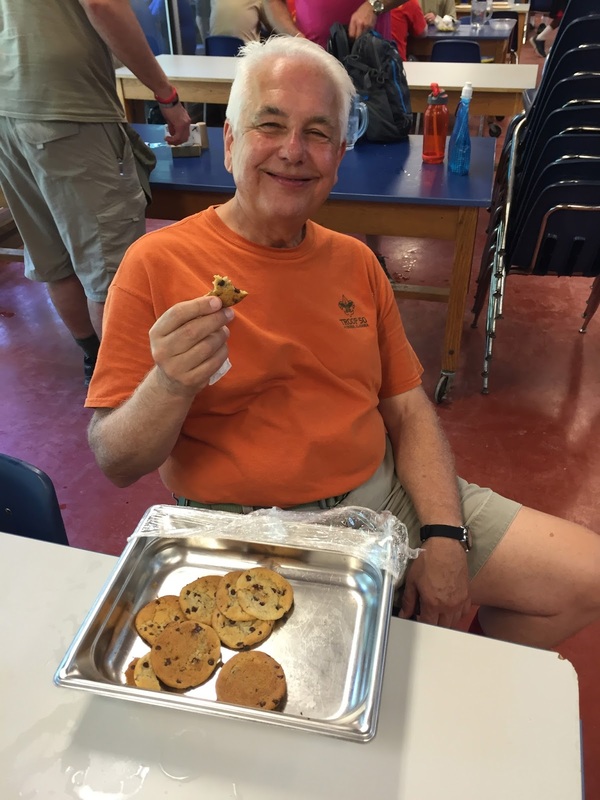 At lunch, the dining hall director came out and told Mr. Williams that she had a special treat for our troop. Mr. Williams has spent the week making friends with everyone he has met from the staff, the scouts, and the leaders. Sometimes the kind words he uses pay dividends as they did today when we received a whole pan of fresh baked cookies. The troop enjoyed the gesture and the cookies. After lunch, the scouts discovered a cache of bamboo left from a pioneering project during the first week of camp. Somehow this location had eluded them all week. Using knives, saws, and other sharp implements, they began to fashion a variety of walking sticks, bows and arrows, and other more menacing weaponry. The whole thing was beginning to have a very Lord of the Flies vibe to it. After one scout was popped in the chin with a stick, I allowed them to posed for a couple of photos before the bamboo was released back to the wild. Parents should be happy that none of it will come home with their scouts. Apparently they were planning to audition for a Survivor episode. Joe apparently was about to lead his people to the promised land. Also during the afternoon, the camp wide games took place. This involved teams made up of scouts from different troops. Several of our scouts took part in various events. Everett returned to the campsite at one point soaking wet. He had been part of a canoe race in which they were forced to abandon the canoe at some point. Luke was part of a group that ate some unusual tasting snacks as part of their challenge. Davis went off to the scout leader versus staff volleyball game. The scout leaders won the first game but the the staff took the next two and won the match. After dinner, we began to break down our campsite and started packing the trailer. The boys were directed toward the showers and told that they must be clean (and clean smelling) for the ride home tomorrow. The final act of the evening was the closing campfire. Various awards were handed out including the Duty to God Award to our chaplains aide, Aiden. Mile swim patches were given to Louie and both Bairds. Louie also receive the Orion Scout Award for his activities this week. The troop was recognized with the Montosky Moccasin Award, which is the honor troop award for Skymont. We earned 1000 points out of a possible 1250 for our activities at camp this week. The other important award that was given at the campfire was the plaque for the winner of the scout leaders' golf tournament. In a tie for first with 14 points was our own assistant scoutmaster Davis Baird. The campfire included skits from the various troops as well. Some were more entertaining than others. One in particular was the hit of the evening. You can see it for yourself on youtube. The skit was entitled, The Most Interesting Scout in the World. Tomorrow morning we will pack up and head home. After a week spent on the mountaintop, we will be ready to return to the Plains of Auburn. Parents should ready their washing machines. Today's crop of photos are found in the online photo gallery.